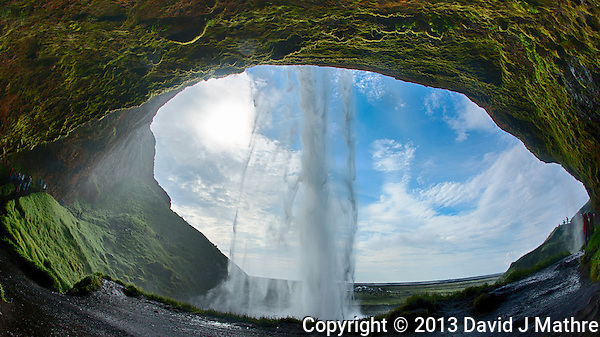 Seljalandsfoss, a Waterfall in Southern Iceland. You can actually walk behind the waterfall. 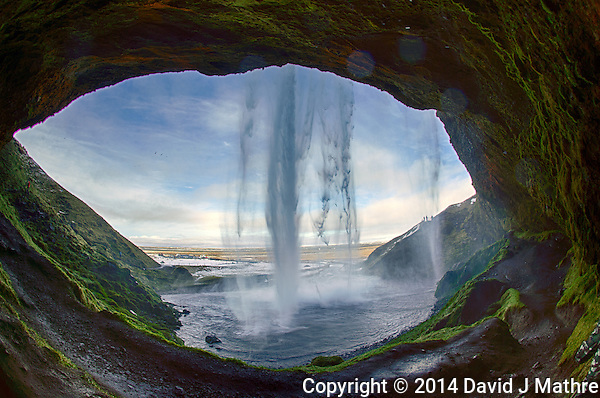 It is a challenge to get a wide enough view and encompass the full dynamic range of the scene. All the time being covered with a mist of water from the waterfall. 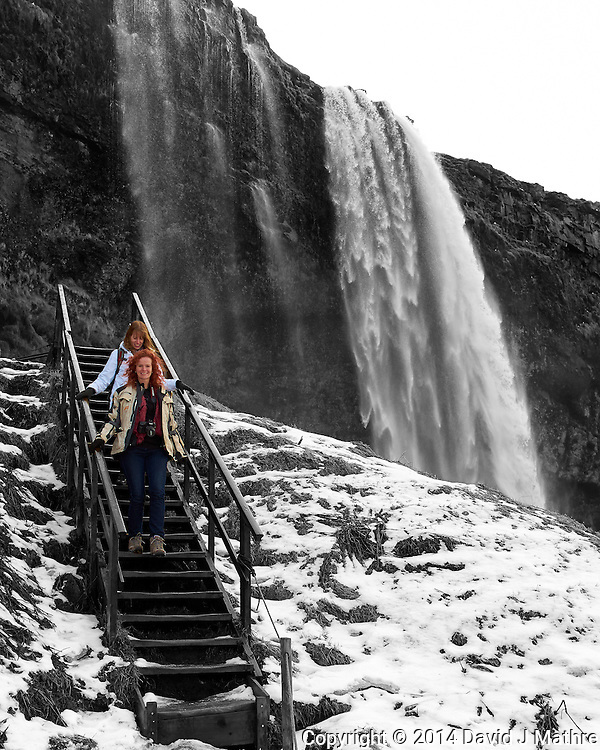 Stairway to Seljalandsfoss, a Waterfall in Southern Iceland. Image taken with a Leica X2 camera (ISO 100, 24 mm, f/3.5, 1/500 sec). Raw image processed with Capture One Pro, Photoshop CC, and Nik Silver Efex Pro. I am not providing the name or recommendation for the workshop leaders for this trip. One of the reasons I signed up was the opportunity to photograph Northern Lights from Iceland. In 2013 I got some great images of the Aurora Borealis in Tromsö, Norway and hoped to do the same in Iceland. I arrived in Reykjavik, Iceland two days before the workshop and arranged a private tour with TripsByLocals.com to go Aurora Hunting. It didn’t look promising when we left the hotel (snowing an hour earlier). For the first 2 hours the sky remained mostly overcast. We then found a spot where the sky started to clear, and started to see the Aurora. It was cold and windy, but I found a place behind the van where I could set up a camera on a tripod. I was able to get 80 images which I used to create a time-lapsed video. The moon was almost full, and lit up the snow covered lava field in the foreground. It turned out that this was my only opportunity to get some good images of the Aurora on this trip. My father commented that it was not as good as the images I got in Tromsö last year. 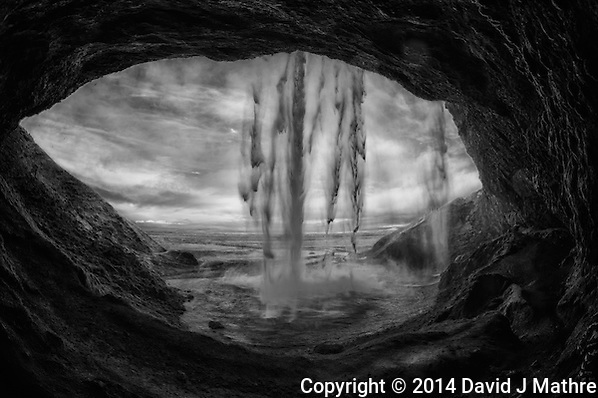 The weather for the Iceland workshop did not cooperate – lots of rain and snow with significant cloud cover. On the first day of the workshop we were supposed to fly from Reykjavik to Höfn but the weather in Höfn didn’t cooperate (even though it was sunny in Reykjavik). After spending some extra time waiting in the Reykjavik airport, it was decided that we would fly to Egilsstadir and take a several hour bus ride to Höfn. On the positive side, I got to see some of the Fjords on the east coast of Iceland, and on the negative side I lost a camera battery on the bus ride between Egilsstadir and Höfn when we had to change from a big 55 passenger bus to a smaller van. Once we got to the airport in Höfn we transferred to the van that would be our transportation for the rest of the workshop. Our first stop was the black sand beach on the coast next to the Jökulsárlón glacial lagoon. Every day when the tide goes out, ice that calved from the glacier in the lagoon goes out to sea, then when the tide comes in, the ice lands on the black sand beach. The makes for some great photo opportunities. However, as we arrived the rain started. We could only stay out for about 15 minutes before getting soaked in the cold and windy rain. We then went to Hotel Smyrlabjörg. I stayed at the same hotel last summer. The Icelandic food served at dinner was outstanding. When I went to sleep it was still raining. During the night the wind increased to the point it sounded like a train was passing outside my window. At about 01:30 AM I woke up and could see some stars in the sky outside my window. I went outside to get a look. It was still very windy. Windy to the point that I could barely stand up. I took a couple of pictures, and could see that the Northern Lights were starting – but there was no way I would be able to stay out in the gale force winds. So I went back to bed. The next morning at breakfast our workshop leader was gushing about how great the Aurora was between 03:30 AM and 05:30 AM. Unfortunately, he didn’t bother to wake the majority of the workshop participants even though he stayed out taking images for his portfolio. There were lots of apologies and excuses that he didn’t know what rooms we were in, but we were all staying in adjacent rooms. This turned out to be the one and only night that the Aurora were visible during the workshop. I was lucky to get the one night before the workshop to see and photograph the Aurora. Most of the others that spent thousands of dollars to see and photograph the Northern Lights as part of the workshop were very disappointed. 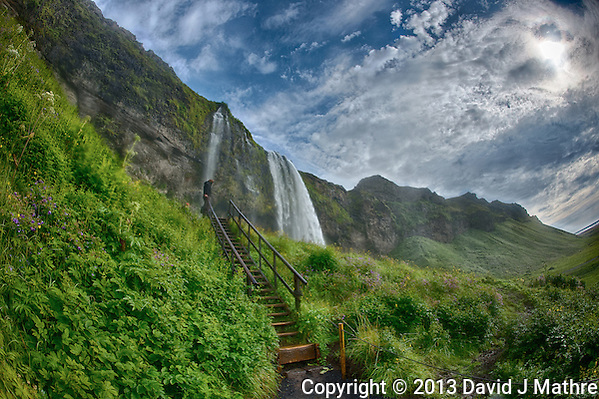 Stairway to Seljalandsfoss, a Waterfall in Southern Iceland. HDR composite of 7 images taken with a Nikon D800 and 16 mm f/2.8 fisheye lens (ISO 100, 16 mm, f/16) using Google HDR Efex Pro 2.